Three grueling hours in a hot and sweaty bus was not my ideal way to spend a Saturday morning. I was reluctant to go and guilty to be reluctant. We were going to Selaqui. I didn’t want to go to the village. I wanted to stay in bed and sleep. I had homework to finish, movies to watch, and the last thing I wanted to do was to leave dorms. I realized how wrong I was around 30 seconds after we reached Selaqui and got off the bus. The sun was shining brightly in my eyes when a little girl named Gunja stared up at me with her big bug eyes and grasped my hand. She was so happy that we were there. I never felt worse. Just three hours before that, I was whining about wasting a Saturday, wondering why I signed up for this dorm event. 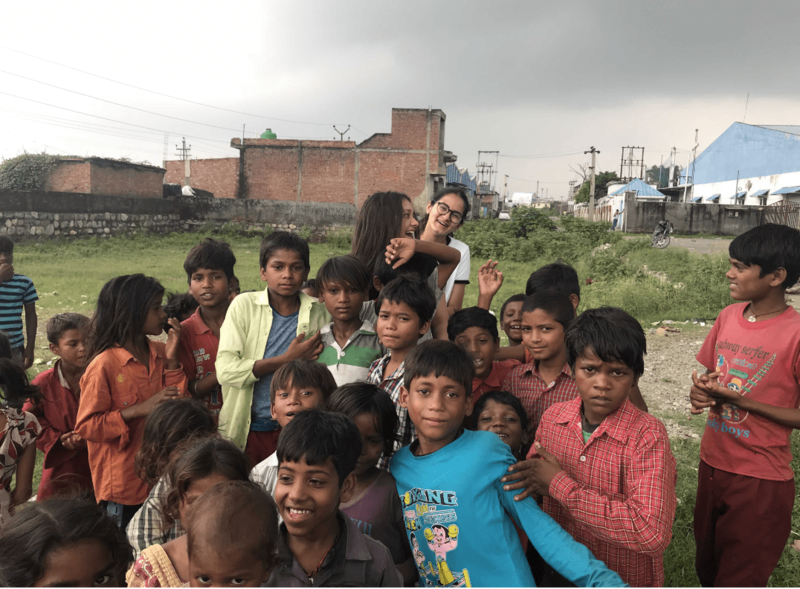 Twelve girls and I volunteered to go with our dorm parent, Ms. Prarthna Singh, to this tiny village outside of Dehradun. Now, I couldn’t think of anything I’d rather be doing. Even my bed didn’t appeal to me. Gunja, second from the left. Photo by Amani Mohan. Around 25 kids of different ages were cramped up in a room with us. Every one of those kids seemed so happy with what they had and they seemed so awed by us. We divided ourselves into groups and went to a field of grass, alongside goats, and played Kho-Kho. Kho-Kho is a game, very similar to tag, where there are two teams of runners and chasers. We played the game until our team was declared victorious. Throughout all of this Gunja never let go of my hand. She was so sweet; she spoke softly and shyly bent her head. She told me about her brothers, her friends, and her favorite colors. Gunja and I were walking along the local river and she tugged on my hand, signaling me to bend down, and whispered that the river wasn’t named. She wanted to name it, something between us. A secret between me and Gunja. “Shivnagar,” she said, and there we had it. “Shivnagar,” our little secret. A very sweet story, feels good that it’s true.